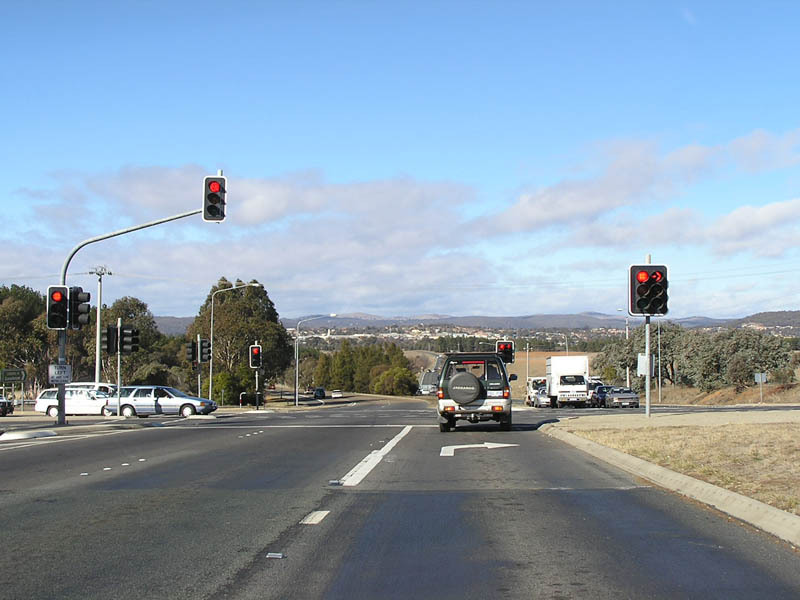 NR52 is quite short, travelling just 5 kilometres from the NSW-ACT Border to the junction with the Monaro Highway and Canberra Avenue at Fyshwick. 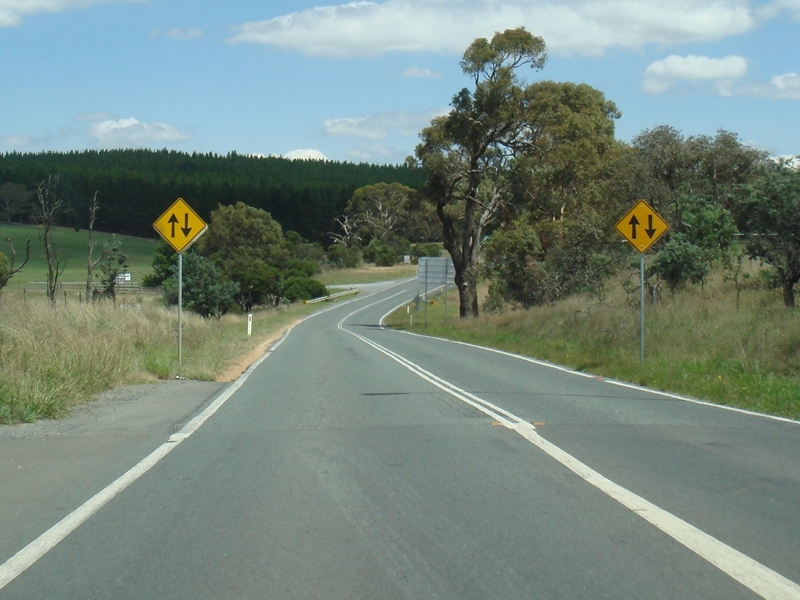 The route starts in the ACT, then crosses into NSW at Queanbeyan, where it becomes B52, then goes back into the ACT for a few kilometres between Queanbeyan and the next major town, Bungendore. 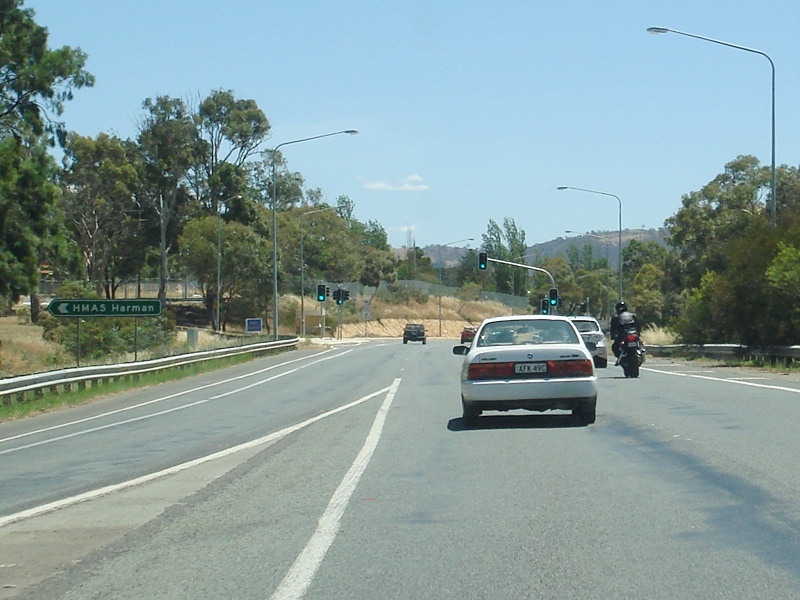 The Kings Highway is the main road to the NSW south coast, travelling through Queanbeyan and several small NSW towns, connecting with the Princes Highway on the coast at Batemans Bay. 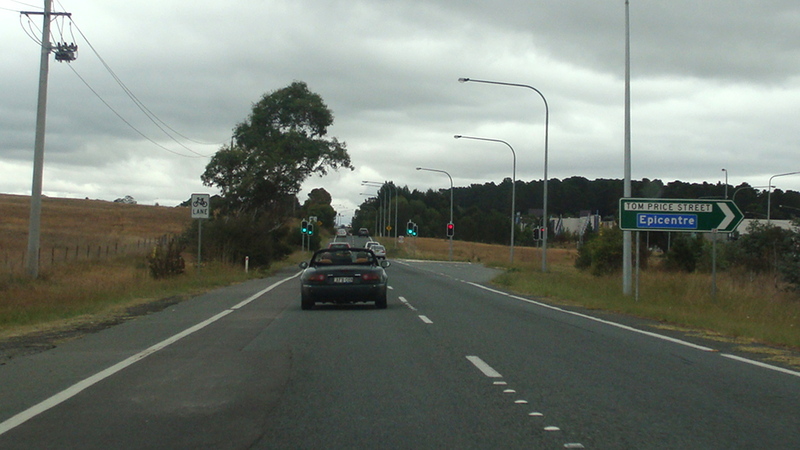 It is one lane each way with occasional overtaking lanes throughout. 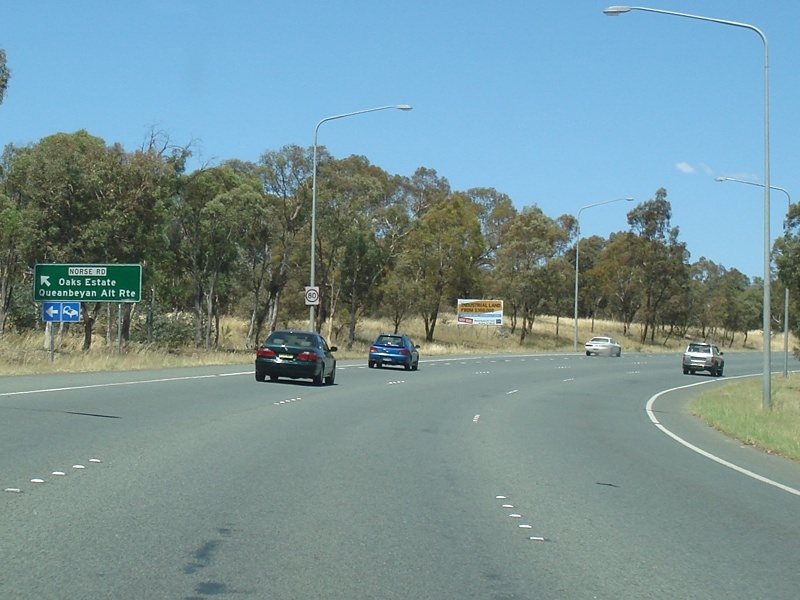 Canberra Avenue (NR23) and Monaro Highway (NR23 / ALT-NR23) Interchange at Fyshwick, the western terminus of NR52. December 2009. 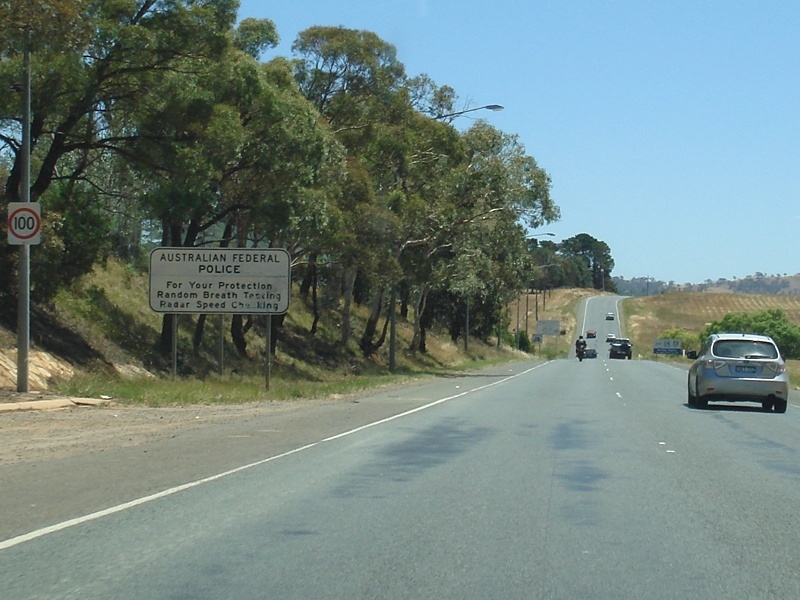 Australian Federal Police patrols sign as you cross from NSW to ACT at Kowen. February 2010. 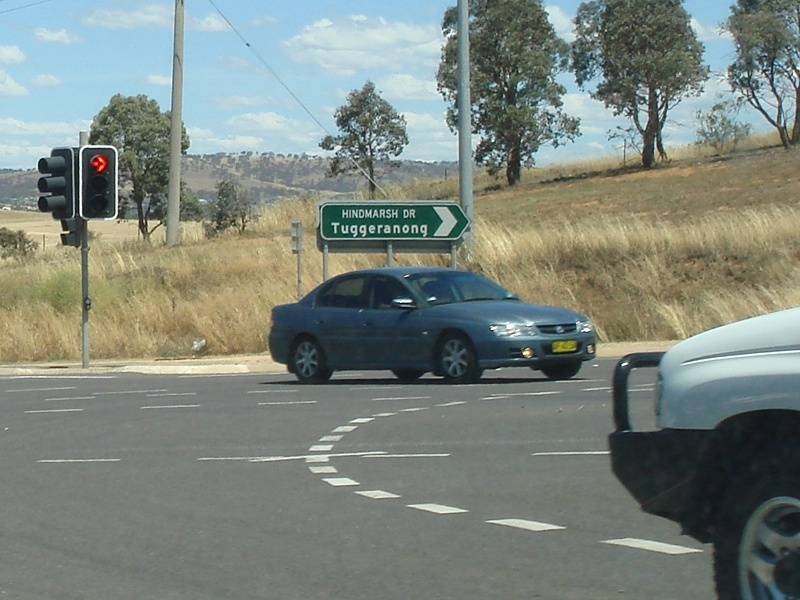 Intersection directional sign assembly on Ipswich St, Fyshwick at the interchange with Monaro Hwy (NR23) and Canberra Av (NR23 & NR52), January 2014. Note the missing NR52 shield. 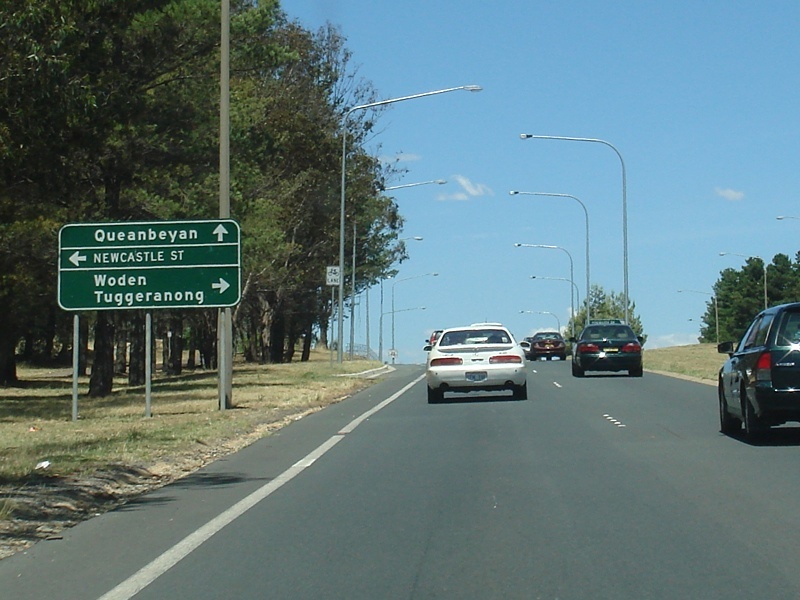 AD sign at Kowen approaching the roundabout with the Australian Defence Force Headquarters Joint Operations Command (HQJOC) Facility. February 2010. 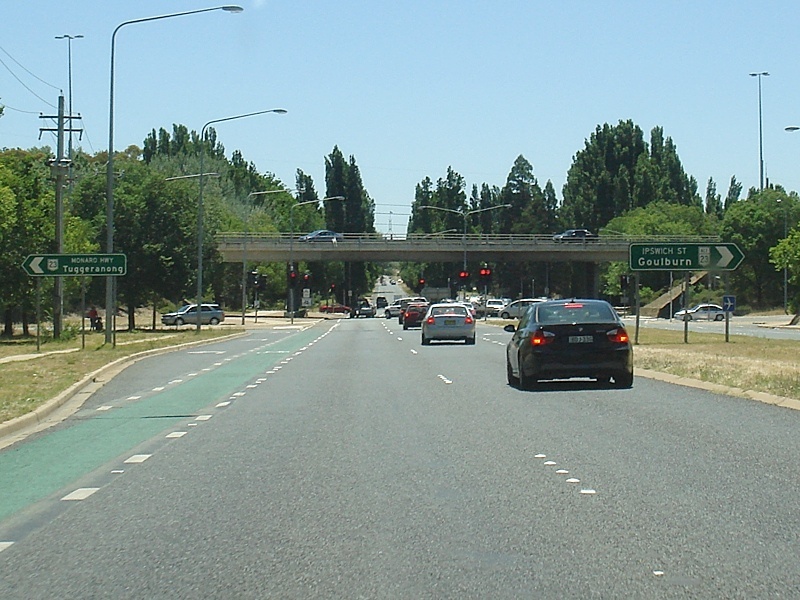 AD sign at Fyshwick approaching Hindmarsh Drive & Newcastle Street. 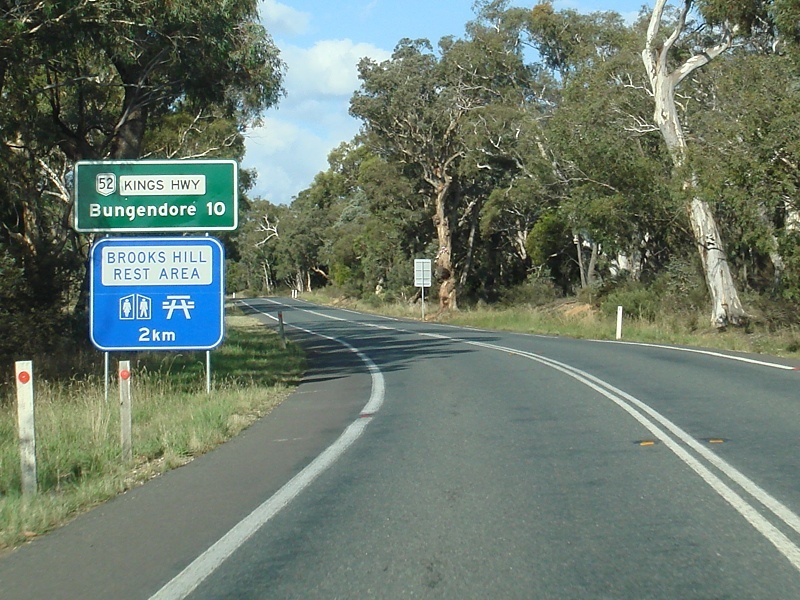 December 2009. 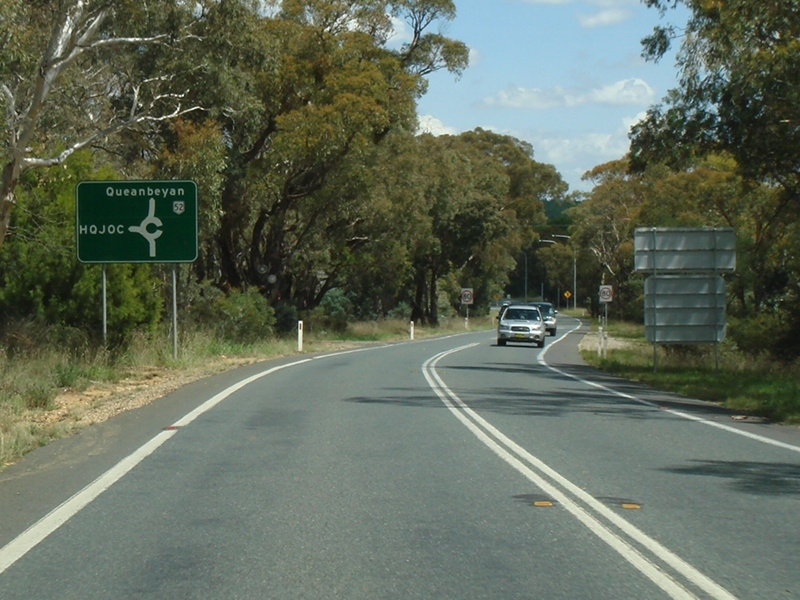 Approaching the short section of divided road approaching the HQJOC roundabout. February 2010. 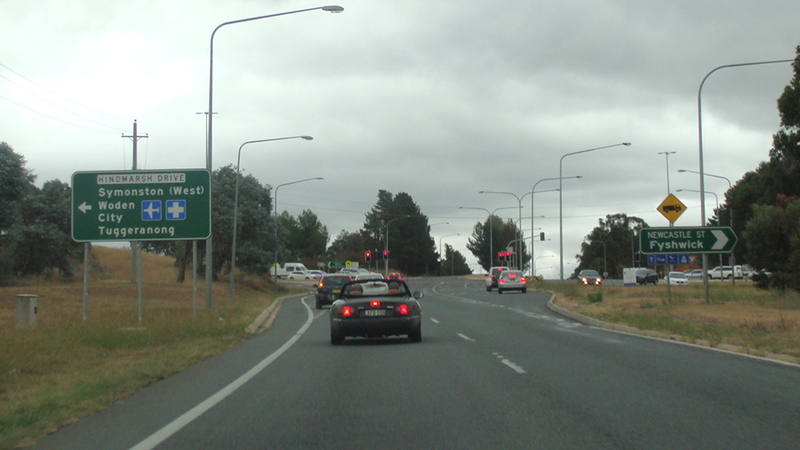 ID sign at the Hindmarsh Dr & Newcastle St intersection in Fyshwick. December 2009. 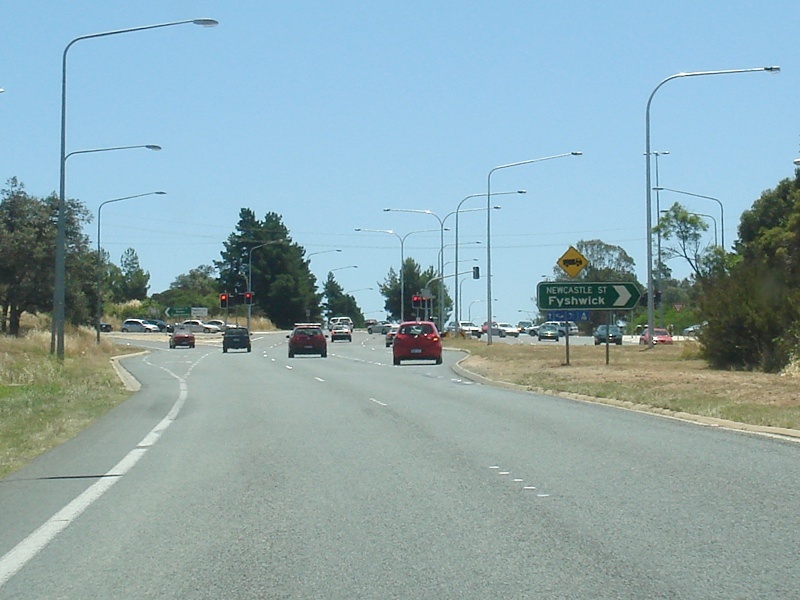 Kings Hwy at Kowen approaching the roundabout with the Australian Defence Force Headquarters Joint Operations Command (HQJOC) Facility. February 2010. 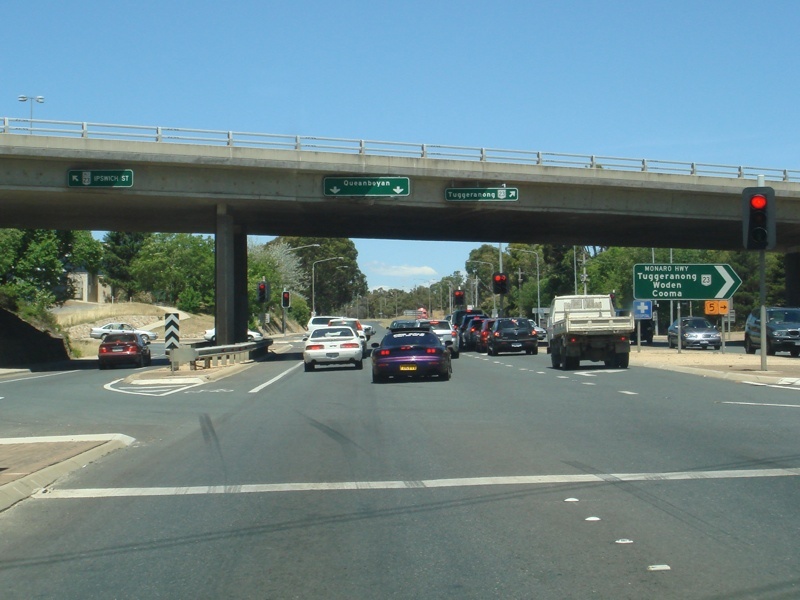 Eastbound as you approach the intersection with Hindmarsh Drive & Newcastle Street at Fyshwick. 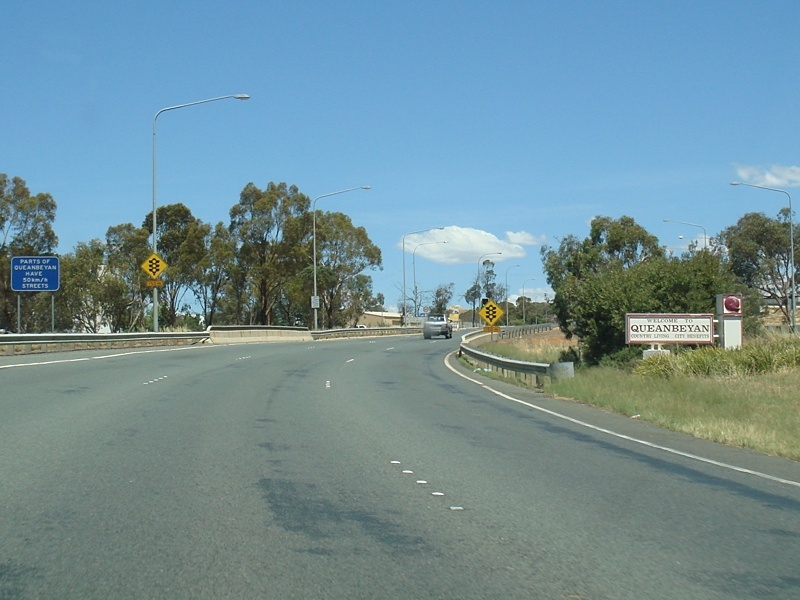 October 2004. 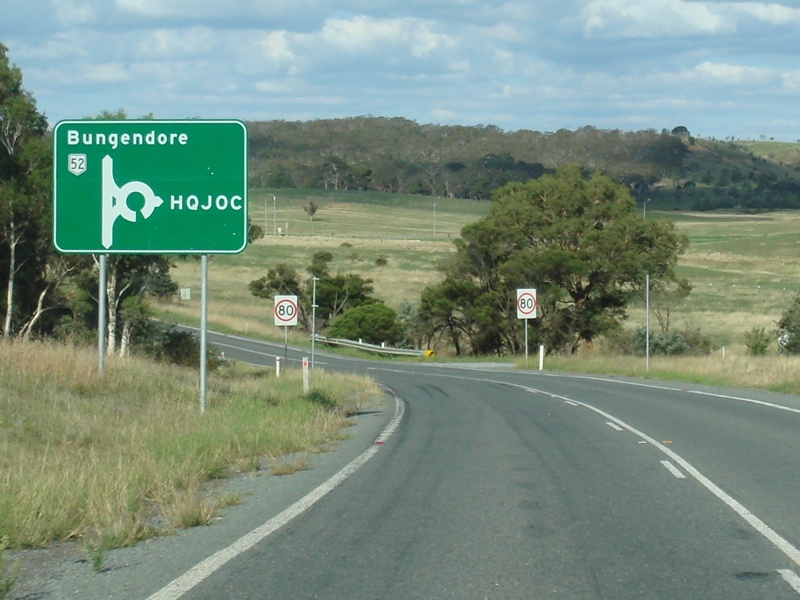 ID sign on the roundabout with the HQJOC Facility at Kowen. February 2010. 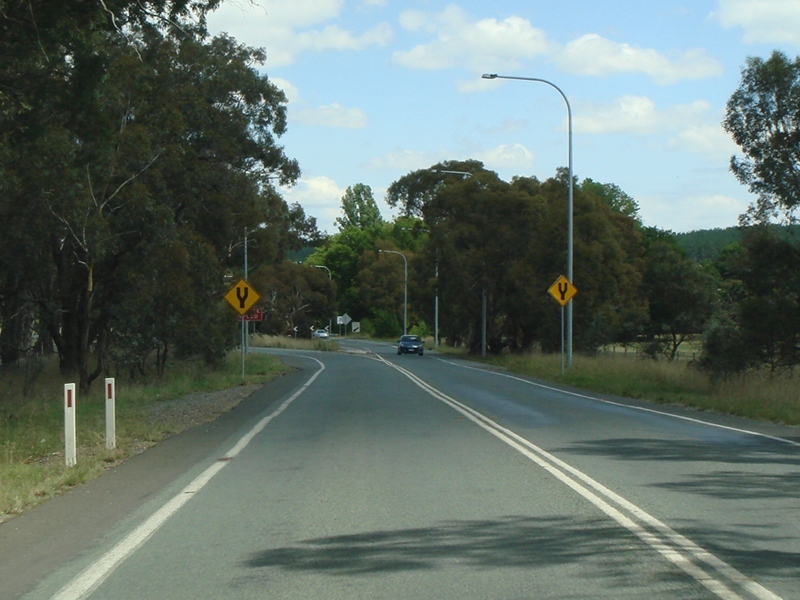 Kings Hwy as it reverts to undivided rural highway at Kowen. February 2010. 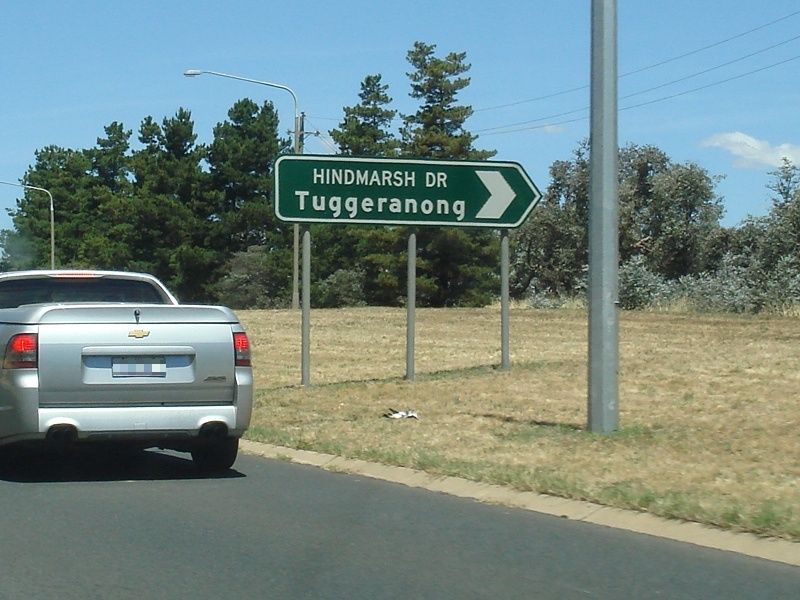 ID sign at the junction with HMAS Harman at Oaks Estate. 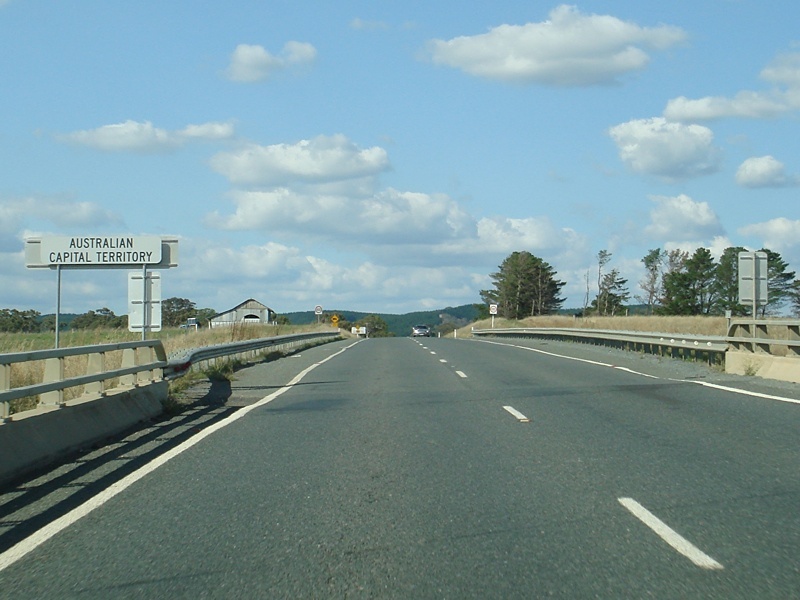 December 2009. 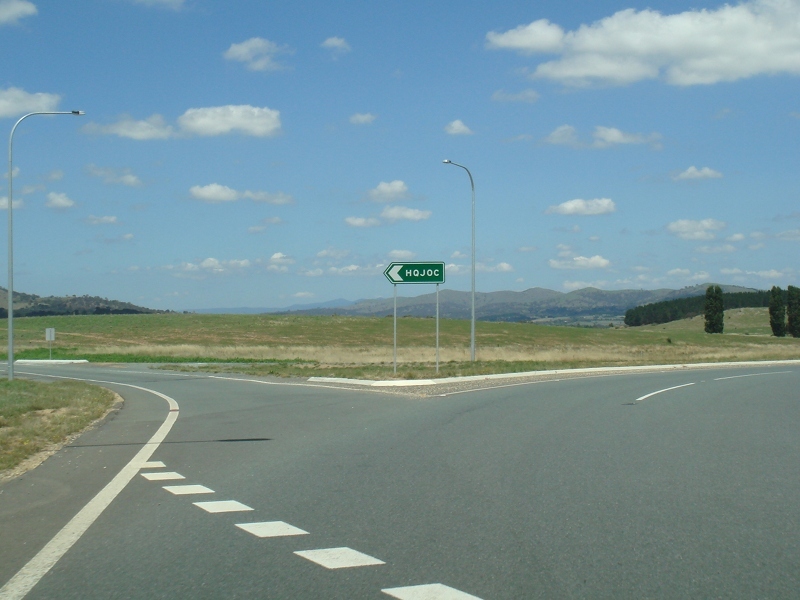 RD sign at Kowen after the HQJOC roundabout. February 2010. 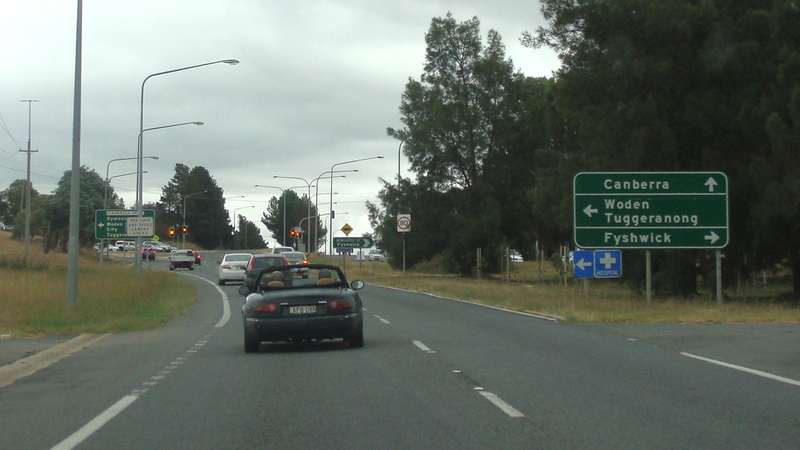 AD sign on Canberra Av approaching the interchange with Norse Road. December 2009. 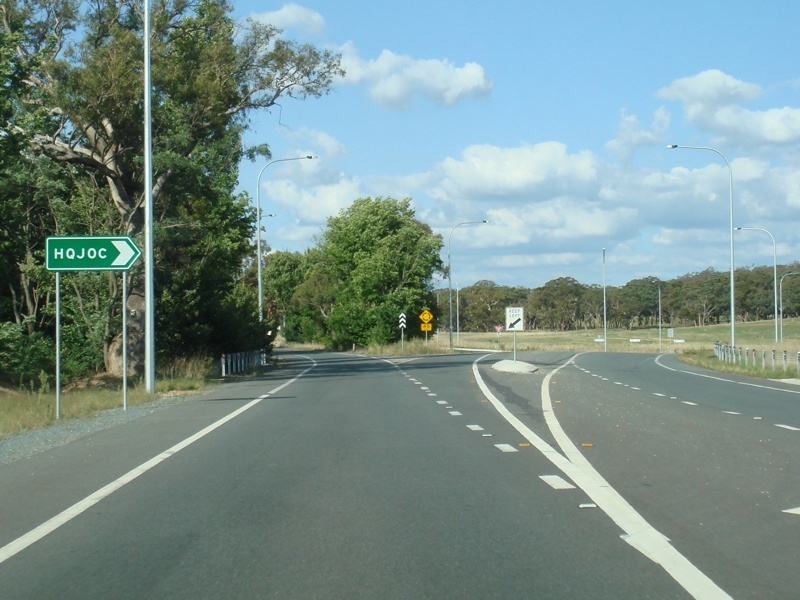 This was the only sign in this direction to show NR52 and has since been removed. 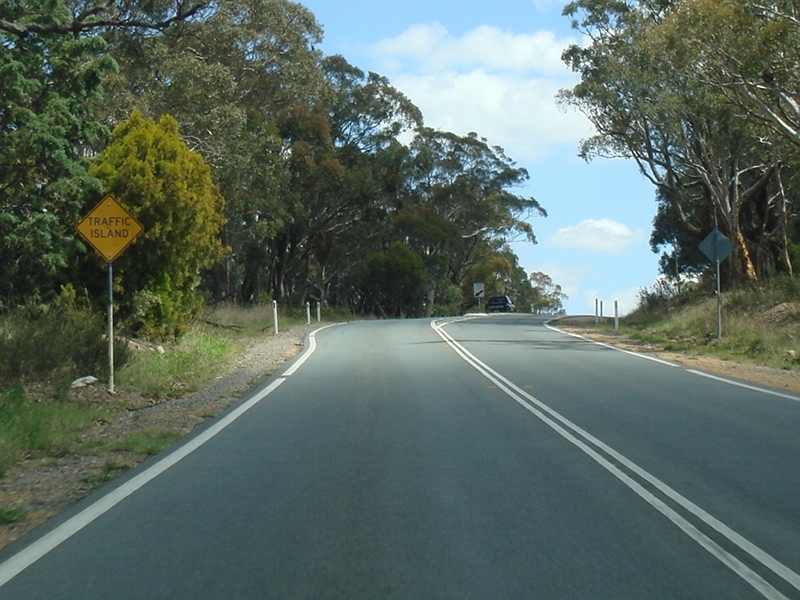 Approaching a small section of divided road over a hill at Kowen. February 2010. 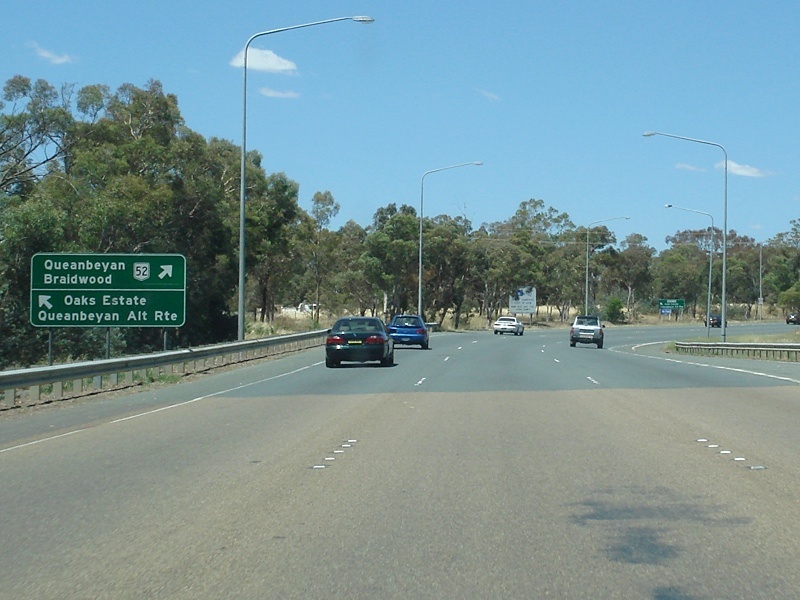 Canberra Av at the Norse Rd interchange at Beard, November 2013. 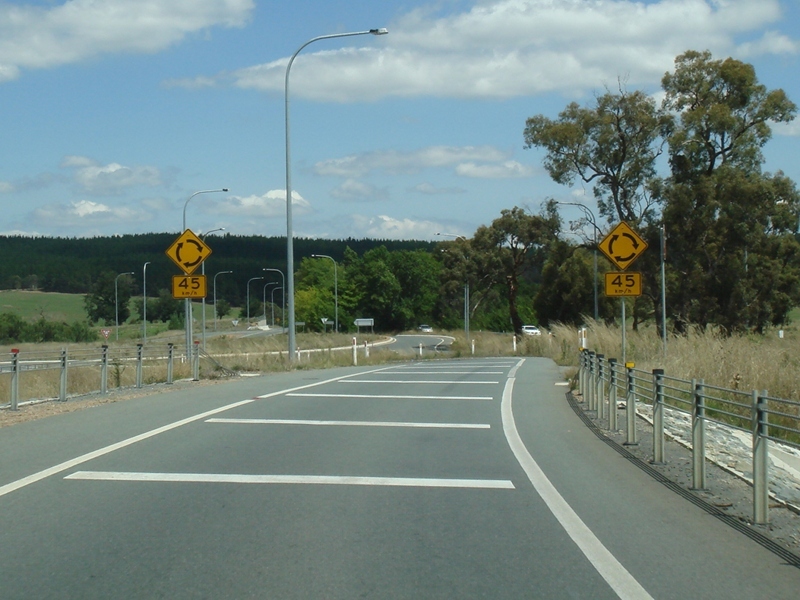 Click here for a photo of the previous sign configuration in December 2009. 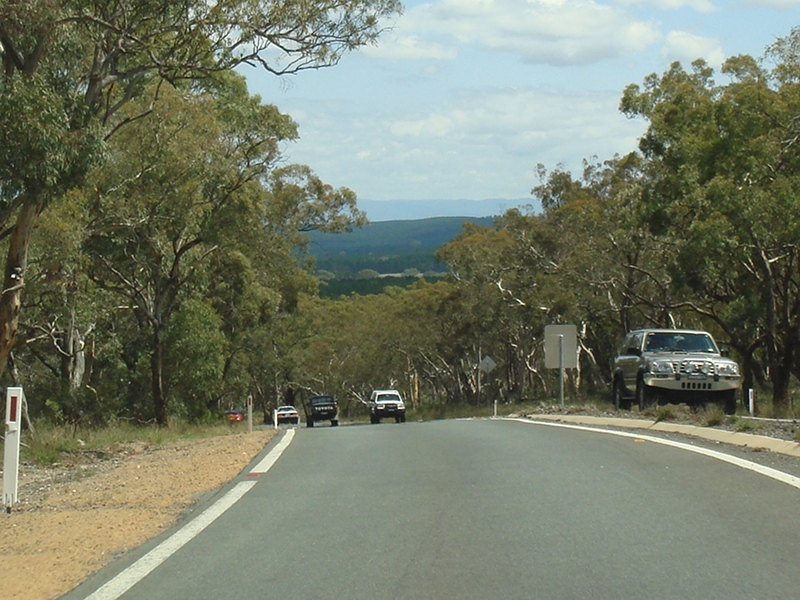 A small section of divided road over a hill at Kowen. February 2010. 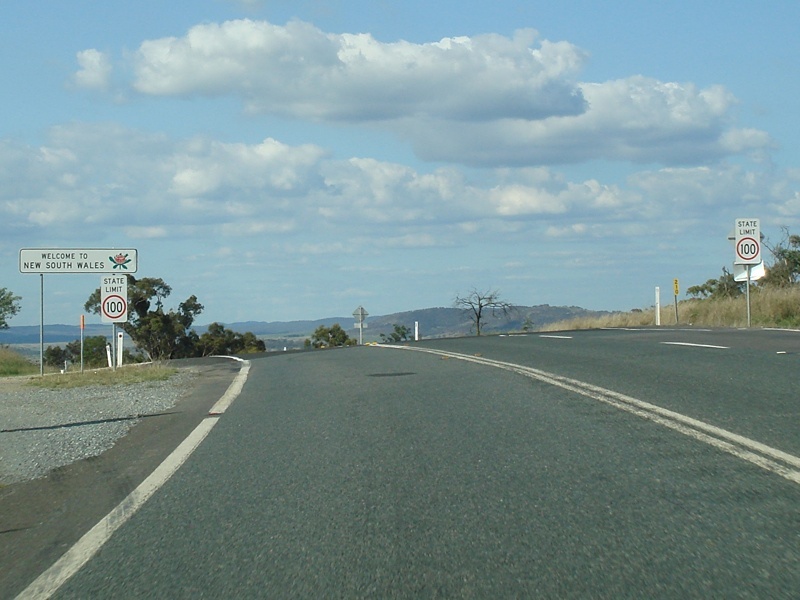 NSW signage on the ACT side of the border at Beard, November 2013. 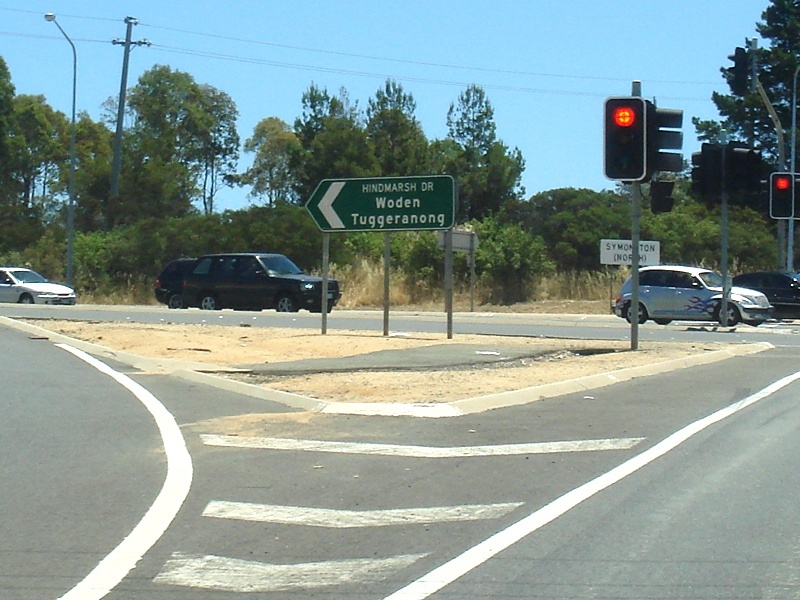 Click here for a photo of the previous sign from December 2009. 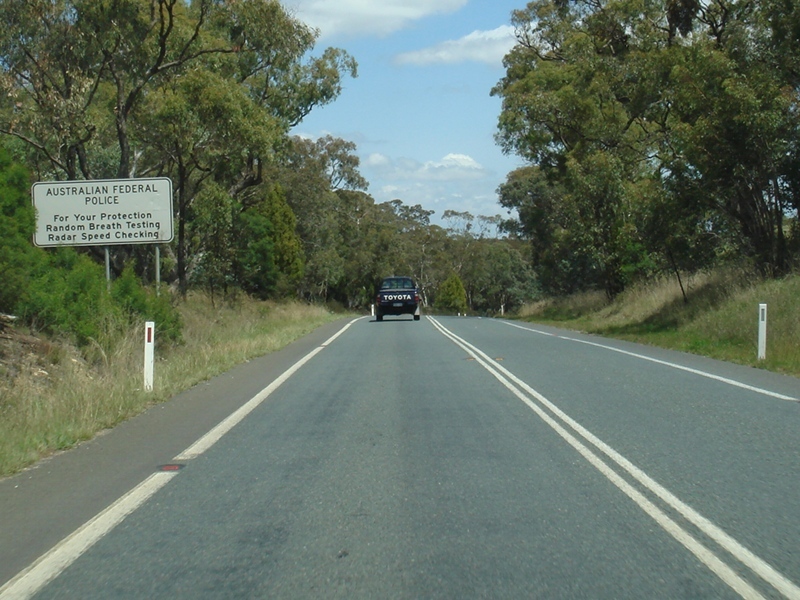 Kings Hwy as it re-enters New South Wales. February 2010. 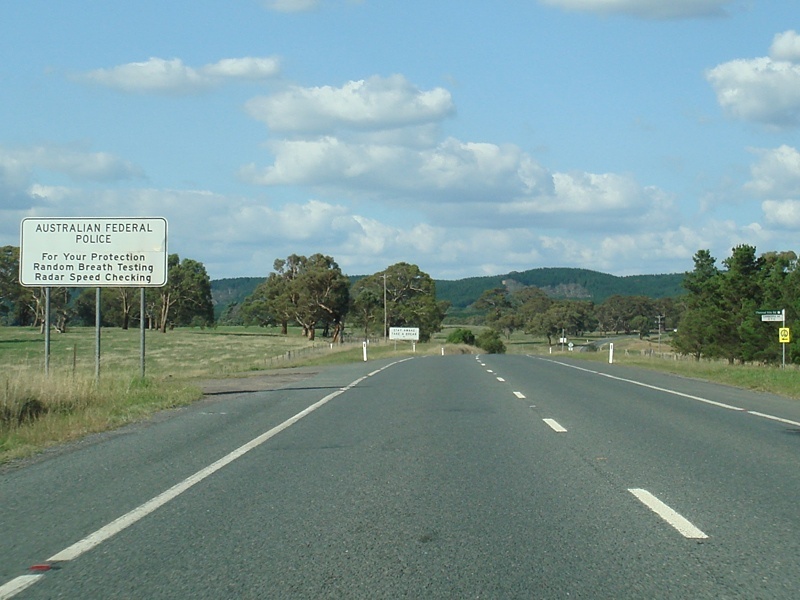 NSW welcome sign as you cross over the border from the ACT. December 2009. 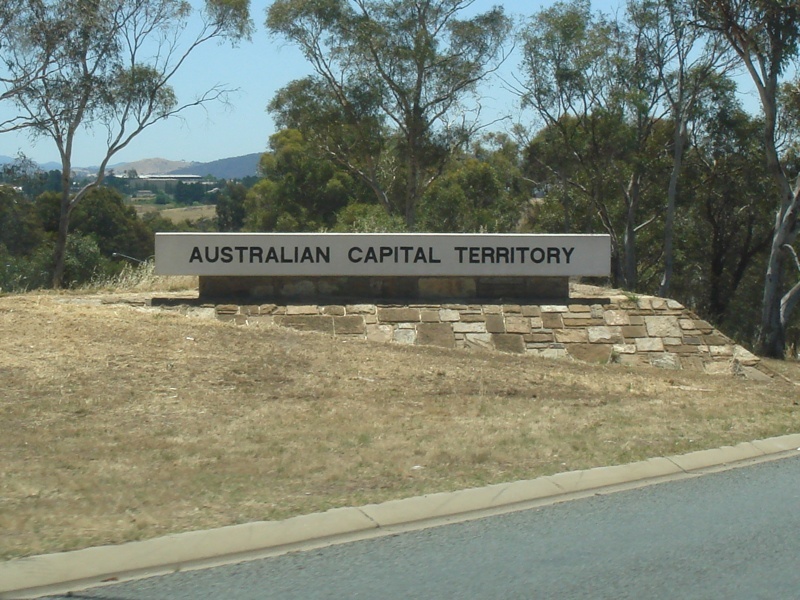 ACT welcome sign as you cross over the border from NSW. December 2009. 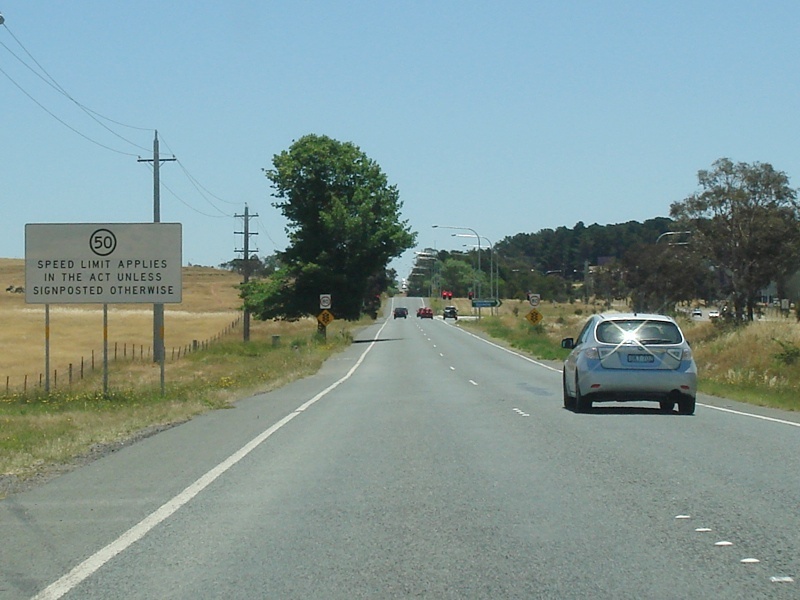 Border sign as you cross from NSW to ACT at Kowen. February 2010. 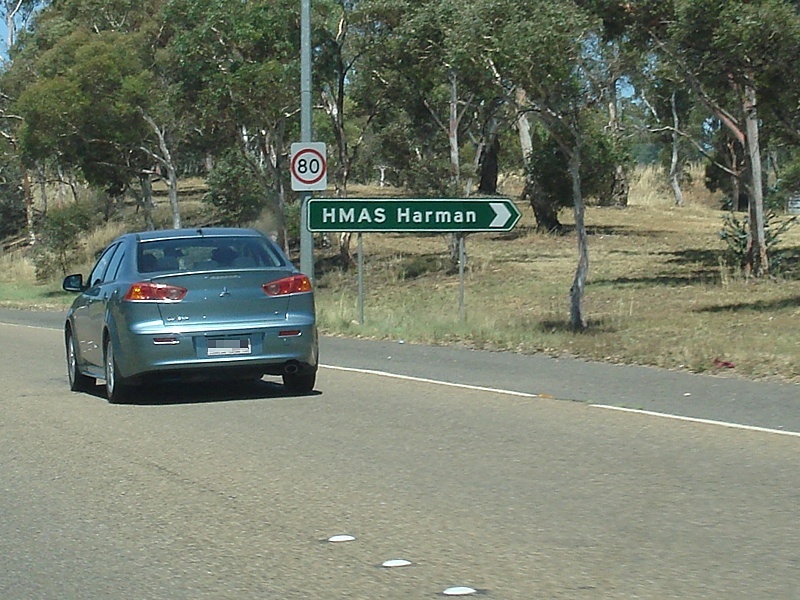 ID sign at the junction with HMAS Harman at Harman. December 2009. 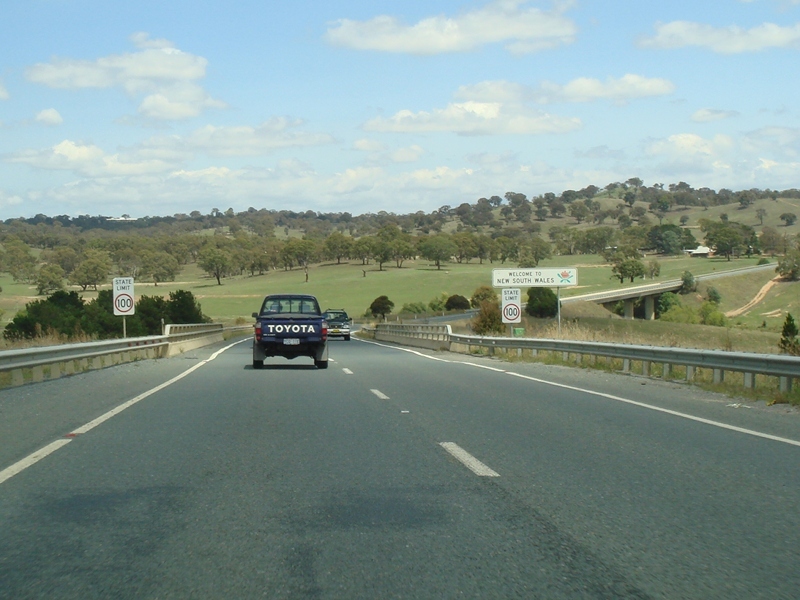 Information on random breath testing and speed checks in the Australian Capital Territory. December 2009. 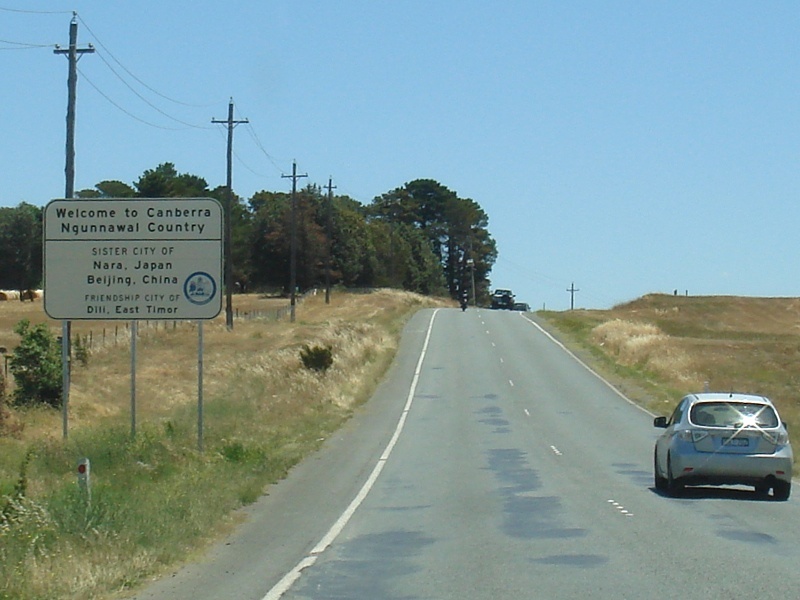 Sign welcoming visitors to Canberra, and also indicates the traditional owners of the land around the ACT area, Symonston, December 2009. 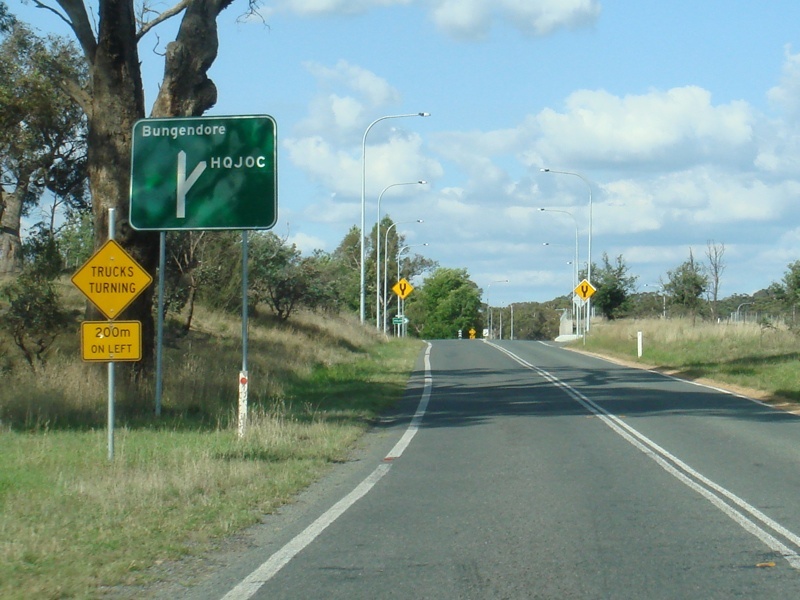 Supplemental AD sign at Kowen approaching the roundabout with the Australian Defence Force Headquarters Joint Operations Command (HQJOC) Facility. February 2010. 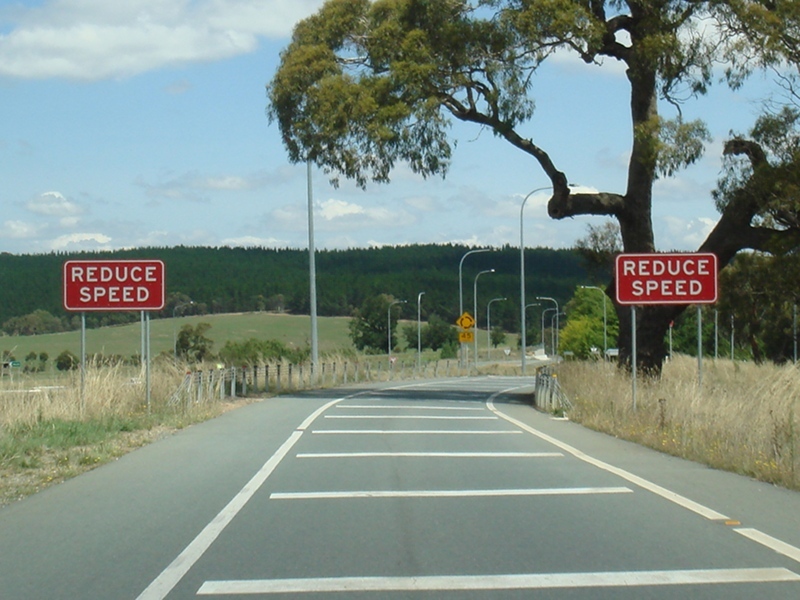 Sign at Symonston incdicating the urban speed limit in the ACT. 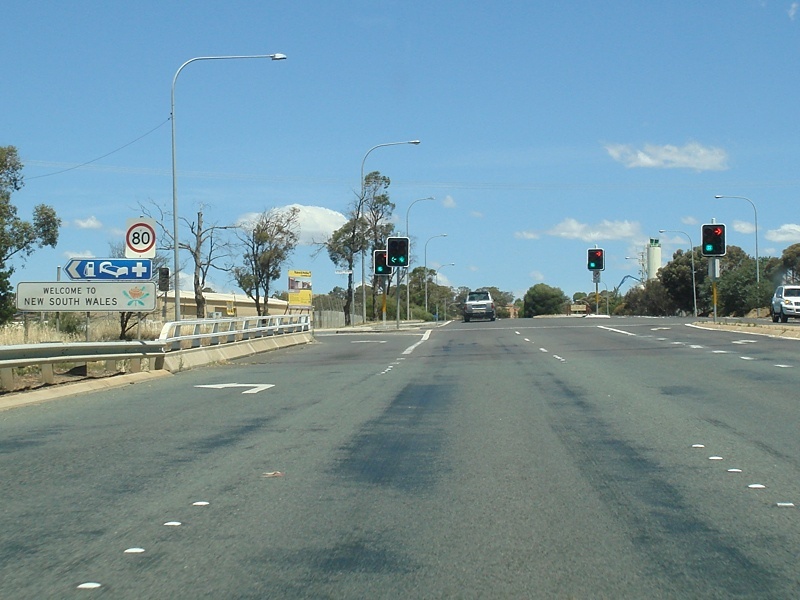 December 2009. 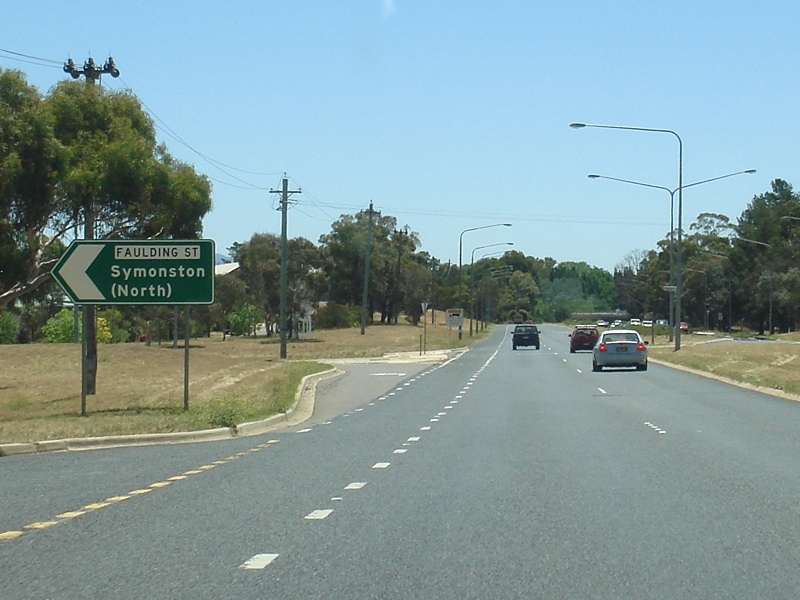 ID sign at the junction with Tom Price Street at Symonston. April 2015. 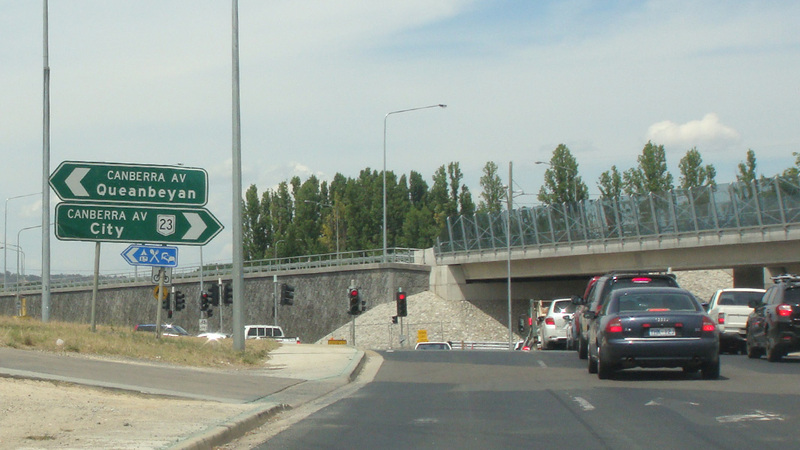 AD sign at Symonston approaching Hindmarsh Drive & Newcastle Street. April 2015. 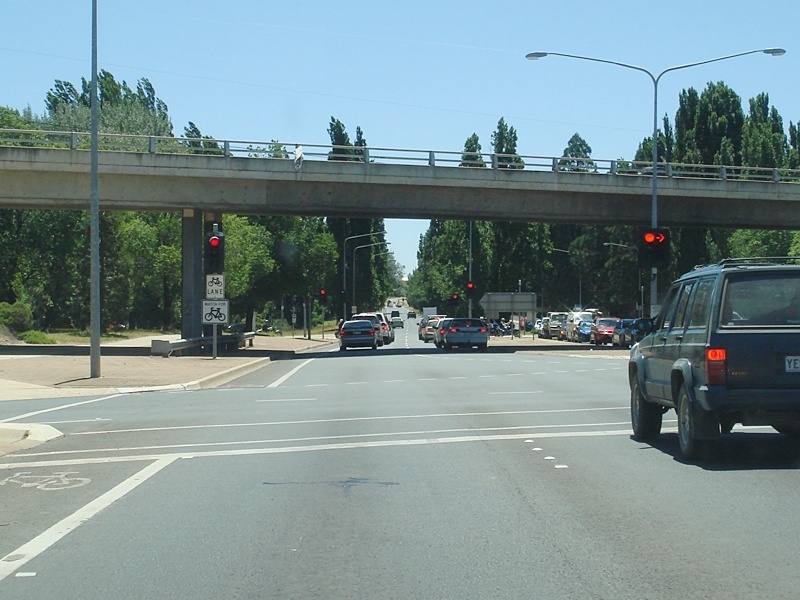 ID sign at the Hindmarsh Dr & Newcastle St intersection in Symonston. December 2009. 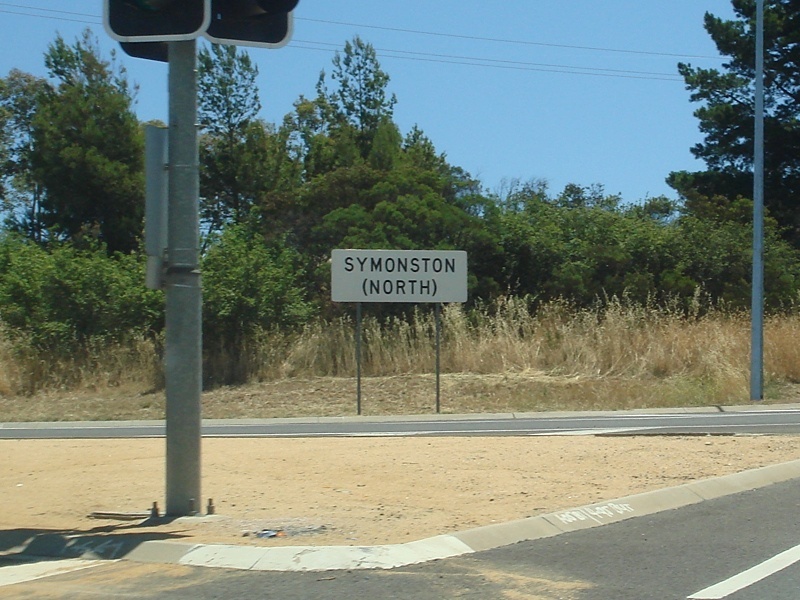 Typical later ACT suburb name sign, Symonston at the Hindmarsh Dr intersection. December 2009. 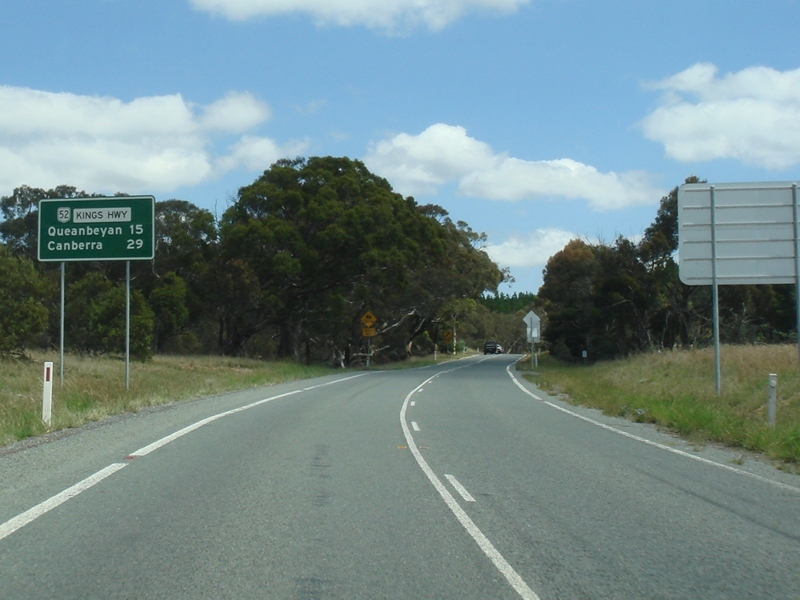 ID sign at the Faulding St intersection in Symonston. December 2009.